Blake Banowetz (‘19) prepares to bat at a game against Central College on May 1, 2018. 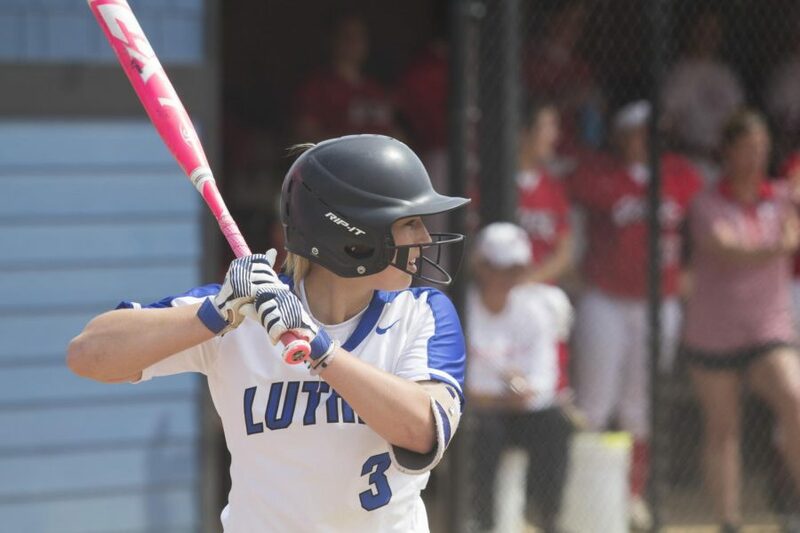 Luther’s Softball Team played their first double-header of the season against St. Mary’s University on Friday, March 15. After a long break without games due to weather, the Norse pulled off two wins against the Cardinals. 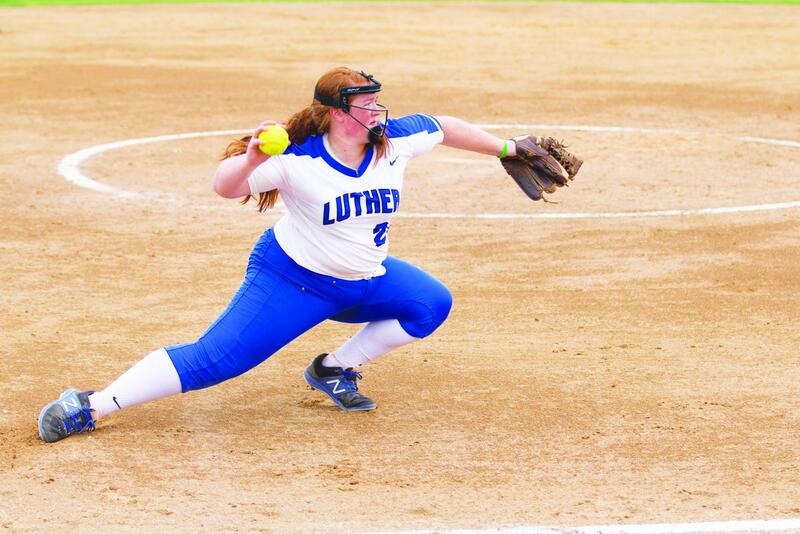 Luther won their first game 5-0 and the second game 3-2. Abby Gehringer (‘20) said the team has been using this time from recently canceled games to prepare for St. Mary’s, a team they have not played yet this season. In the first game, Paige Timmerman (‘20), Gehringer and Elsa Skeie (‘21) drove in runs in the first inning, followed by Sierra Freeland (‘21) who drove in the last run in the seventh that allowed Annie See (‘20), Timmerman, Blake Banowetz (‘19), Megan Elford (‘22), and Gehringer to score. The fifth run of the game was scored due to an infield error by St. Mary’s. Pitcher Samantha Bratland (‘19) tossed her 21st career shutout during the first game. Within the seven innings of this game, she only allowed two hits. Freeland and Banowetz both were two-for-four in hits during this game. Following the momentum from the first game’s win, the team came back with a second defeat over St. Mary’s. Pitcher Kendra Cooper (‘22) secured her first collegiate win, only allowing two runs on three hits. The Norse took a 2-0 lead after a sac fly by Skeie and a double by Gehringer. Runs were scored by Banowetz and See. The Norse were able to keep the Cardinals at bay until the top of the fifth inning, where the Cardinals scored two runs, tying up the game. In the bottom of the sixth inning, the team worked together to allow Emily Fell (‘22) to score the game winning drive. Courtney Cooper (‘21) plays on the field in a game against Nebraska Wesleyan on April 22, 2018. Associate Head Coach Teri Olson (‘05) felt that the team, especially Kendra Cooper, overcame challenges during the games. In the bottom of the sixth inning of game two, Kendra Cooper and Addy Pender (‘19) hit back-to-back singles. Pender has noticed how the team has already grown this year. 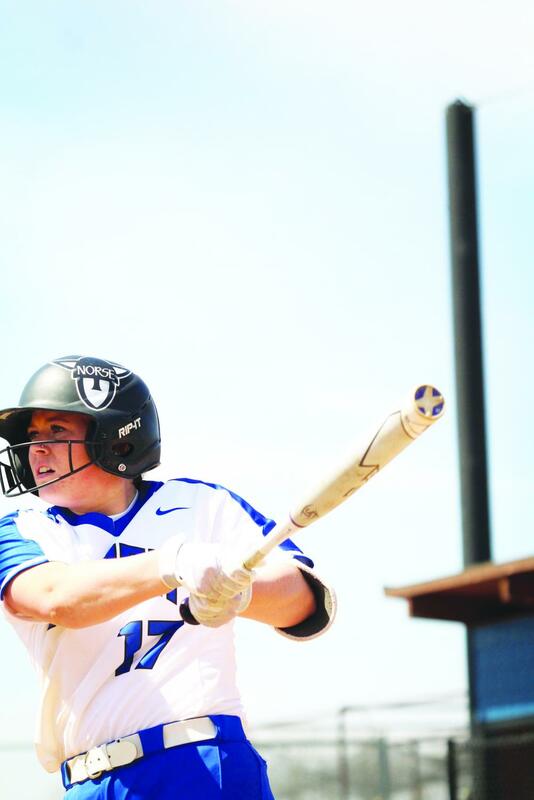 Annie See (‘20) takes a swing during a game against Nebraska Wesleyan on April 22, 2018. Following their wins this past Friday against St. Mary’s, the team will travel to Florida over spring break to play 10 games on outdoor fields. Looking forward to the rest of the season, Courtney Cooper (‘21) says the team plans to take it one step at a time.